Scientists at the US Department of Energy's Pacific Northwest National Laboratory and University of California, Los Angeles have shown how 2D materials can skip the energy barrier by growing one row at a time, in collaborative research that could lead to the construction of new classes of materials. The study helps confirm a prediction by US scientist J. Willard Gibbs in the 1870s that some materials follow an underlying rule to assemble on surfaces one row at a time, which could offer innovative design rules for microelectronics, membranes and tissues. As reported in Science [Chen et al. Science (2018) DOI: 10.1126/science.aau4146], the findings offer evidence on the impact of dimensionality on nucleation of solids, as well as that molecules that form 2D or 3D solids can behave like one-dimensional materials depending on how the molecules assemble. It provides insight into the nature of nucleation, the formation stage in the creation of most solids from solutions, melts or vapors, and which is pervasive in ordered structures in both nature and technology. Gibbs' nucleation theory can be applied to the transformation of liquid water into solid ice, which depends on the creation of a solid–liquid interface. While water turning into ice saves energy, creating the interface uses energy. At the start, when the surface area of the new particle of ice is large compared to its volume, it needs more energy to make an ice particle than that is saved. Gibbs' theory says that if the materials can grow in one dimension there will be no such energy cost, and the materials can avoid the nucleation barrier and self-assemble. With atomic force microscopy, the rows were observed as they formed, and were ordered right from the start and grew at the same speed regardless of their size. New rows were also formed as soon as sufficient peptide was in the solution for existing rows to grow, something that would only happen if row formation was barrier-free. 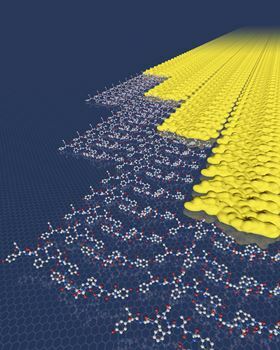 The study could offer new opportunities for devices based on 2D materials assembled through interactions in solution, and the team now hope to produce artificial molecules with the same properties as the peptides used, but more robust. By studying how peptides assemble, researchers have discovered that some materials can avoid the nucleation barrier by growing one row at a time.